Oh how we feel lucky to be greedy foodies living in this time - with such a culinary buzz wherever you look- much more attention than ever to fresh produce and independently run local restaurants, delis and cafes popping up all over London. The abundance throughout the year of locally sourced produce brought in to farmers markets and greengrocers is simply wonderful, that sense of seasonality and the harvests is something that should be ingrained from childhood- which is so easily not seen in an industrial cosmopolitan city. To remember the dire salads from ones childhood- overcooked boiled eggs, iceberg lettuce, overly vinegary dressings with floury tasteless tomatoes- my goodness they have changed! The variations are endless- of contrasting crunchy textures of roasted nuts and seeds or even our favourite of fennely spiced crumbs, to flavours that come together harmoniously of zingy tangy dressings and tart crumbled cheeses, and soothing herby yoghurts. Ottolenghi, for us, really opened our eyes and showed us how a salad could be, a celebration of fresh ingredients- an inspired mixture of herbs, spices, grains, vinegars and oils. The beauty in which salads were presented- dishes that were bold and confident- layered across a big round plate (rather than piled into bowls)- grilled slices of aubergine with leaves of basil, tarragon and dill, dressed in a black garlic dressing. He also broke the English old school foodie affliction of adding meat to dishes, making it always the main ingredient- he celebrated vegetables, making them exciting and different like nobody else, his cookbook Plenty More is one of our favourites ever! This summer we have been asked by the Mount Street deli in Mayfair to come up with two salad recipes that they can sell- for which we chose one from our cookbook, a labneh and smokey saffron tomato with crisped chickpeas coming out on 16th August, and then for the second this summery fresh chicken salad which comes out first on 6th August. We wanted to create a zingy chicken salad that was soothing and punchy at the same time, whilst holding well and not needing to be put together at the last minute. We came up with a dressing for the chicken that only improves through marinating over a few hours in it, which is perfect for a ready to go deli salad on the go. Nice to keep the chicken in its mixture at the bottom of a serving bowl, with the salads leaves and herbs ontop- that feeling that it could take into flight. Making dressings like this is something we love, can be prepped before giving ease, but also the mixture of blitzed- herbs, spices, lime, yoghurt and feta coming together to create something really delicious- that perfect tang that makes you smile. For us getting to do these collaborations is a real highlight, such an amazing opportunity to grow and learn with what we do- So incredibly inspiring! Really was such an honour to work with the team at Mount Street- where seasonality and provenance is key to the menu, excellent produce sourced principally from the British Isles… and also, very good coffee. Right in the heart of Mayfair, we like to think of people in their busy day to day running about grabbing this, getting nurtured and with hopefully a smile! 1. Bring 1 litre of water to the boil in a large shallow pan with the bay and season. Add the chicken breasts and simmer over medium heat for 5 minutes. Remove from heat and cool the chicken in the liquid for up to 1 hour. 2. Dry roast the coriander and cumin seeds over a medium heat until fragrant, around 5 minutes. Then grind to a course powder. In a blender blitz the rest of the dressing ingredients, season and taste for any adjustments. 3. Shred the chicken and then mix into the yoghurt dressing. 4. Steam the peas for no more than one to two minutes. 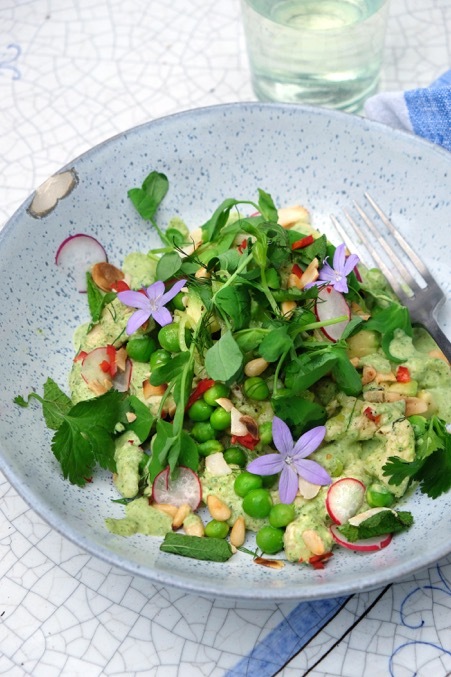 Cut the avocado into 1cm cubes and put into a bowl- combine with the sliced fennel, shallots and peas and then squeeze with lemon and add seasoning and olive oil- then toss in the pea shoots. 5. Over a low to medium heat dry roast the pine nuts until golden, and then the flaked almonds. 6. To serve generously spoon the chicken onto a plate- then a large handful amount of the salad on top with a sprinkling of pine nuts and almonds followed by a scattering of herbs, edible flowers and the chopped chilli.